The Unabomber, nicknamed such from the FBI’s title for him “UNABOM” (UNiversity and Airline BOMber), in a series of 16 total bombings from May 25, 1978 to April 14, 1995 spanning across the U.S., killed three people and injured 23 more, yet somehow managed to avoid getting caught. Then, on September 19, 1995, the Washington Post printed a 35,000 word manifesto that had been authored by the elusive Unabomber himself. He had originally sent the manifesto stating that if it was widely published, he’d stop his bombings. 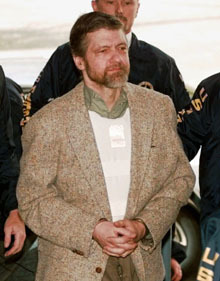 Initially, the FBI worked out a deal to have it published in Penthouse, but this was not the standard of mass-publication the Unabomber was looking for, so he wrote in stating that if Penthouse was the only one publishing it, he’d reserve the right to one more bombing, rather than stop as previously promised. After much serious discussion between the FBI and Attorney General Janet Reno, the Washington Post, in collaboration with the New York Times, printed the manifesto on September 19th, which can be read here, if you’re interested. David Kaczynski, at the encouragement of his wife Linda who felt that her brother-in-law might be the Unabomber, read the manifesto. After reading it, he agreed with his wife and thought the author’s style of writing and his brother Ted’s were strikingly similar, even using some of the same phrases in describing his philosophies. It was then he decided to call the FBI and share his suspicions. Many in the FBI were doubtful the Unabomber was Ted Kaczynski, even after David produced several documents of his brother’s showing the similarities in writing style and philosophies. But, eventually, the FBI got a warrant and decided to go check out Ted Kaczynski’s home for themselves. What they found there, among other things, was bomb making equipment and what appeared to be the original draft of the manifesto. As such, Ted Kaczynski was placed under arrest at his remote cabin in Lincoln Montana on April 3, 1996 and later plead guilty in 1998, and was sentenced to four life terms without the possibility of parole. Theodore John Kaczynski was born in Chicago in May on 22, 1942. A gifted math prodigy, at the age of 16 he entered Harvard University. After receiving a Ph.D in mathematics from the University of Michigan at Ann Arbor in 1967, Kaczynski landed a job as an assistant professor at the University of California at Berkeley. Suddenly in 1969, Kaczynski left his job and began living as a hermit in a tiny Montana cabin lacking both running water and electricity. For necessities such as food, Kaczynski received occasional help from his family.